Technology is going to lead, but old school rules will ensure success. 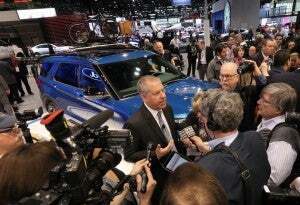 Joe Hinrichs, Ford president of Global Operations, meets with the media after the announcement that Ford would pump $1B into the Chicago plant. As the auto industry stands on the cusp of a huge upheaval, Ford Motor Co. is pursuing a strategy that not only looks to new technology, but also relies on the deft use of the manufacturing skills that were instrumental in the company’s rise more than a century ago. Joe Hinrichs, Ford president, Global Operations, said the billion-dollar investment the company is making in its manufacturing operations in Chicago, where the company has some 6,000 blue-collar workers and plans to add 500 more in the few months, will depend utilize both the latest automation but also the human touch. 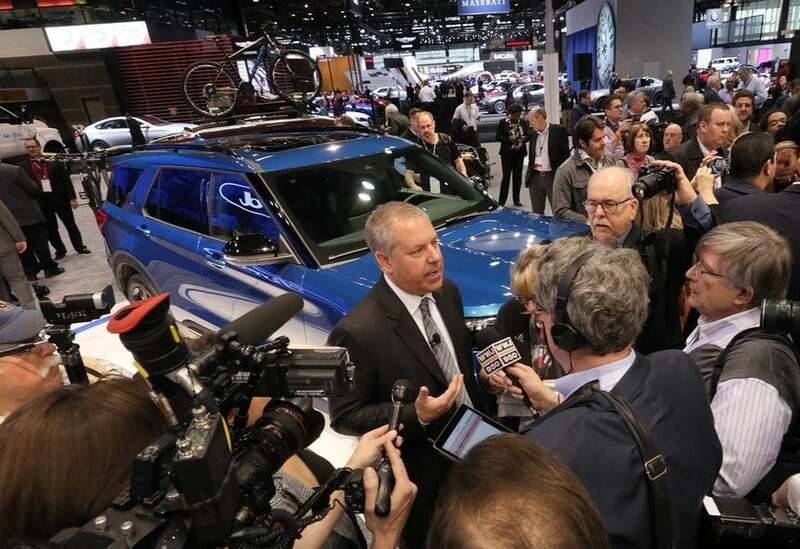 “We’re going to have a new, highly-automated paint shop and body shop,” said Hinrichs talking about Ford’s future plans with reporters at the Chicago Auto Show. But Ford is also depending on the skill of its employees to build the new Ford Explorer and Lincoln Aviator.as well as specialty vehicles such as the police interceptor that is based on the Explorer. “Of course, we’re going to have new automated press lines,” he said. “But it’s also about people. They’re the ones who put their craftsmanship into the vehicles,” he said. Thus, as part of its investment in Chicago, Ford has also set aside a substantial sum, $40 million for training, and physical improvements such as new lighting, greater security around the plant and new cafeteria that will improve work life of its employees. “We have a great relationship with UAW,” said Hinrichs, who volunteered that he had met with Gary Jones, the president of the United Auto Workers, the union representing production workers at Ford’s plants. The amicable relations between the Ford and UAW, stand in stark contrast with the union’s relationship with General Motors where conflict about plant closings has been the order of the day. Hinrichs also noted that the Chicago plant now exports vehicles from the city’s south side to more than 80 countries around the world. As a company, Ford actually sells more goods to China than it imports, he said. “We have trade surplus with China,” added Hinrichs, though that is likely to change as Ford sources more work with Chinese suppliers as part of its plan to reduce losses in the Chinese market. Ford’s prowess as exporter, however, also means that it has to pay close attention to the U.S. trade negotiations with the rest of the world. The next round of talks between the U.S. and China are very important. Ford also is hoping the new U.S. Mexico Canada Agreement, which is supposed to replace NAFTA, will be approved quickly. The importance of trade relations was underscored last year when Ford’s cost rose by $1 billion dollars because of U.S. tariffs on imported aluminum and steel. “I think the tariffs on aluminum and steel will be removed,” added Hinrichs, who is quick to note that Ford builds more of its vehicle in the U.S than any other manufacturer. The automotive markets in North America are highly integrated, he said, and uncertainty undermines Ford and other carmakers require to operate. “We need stability,” he said. This entry was posted on Friday, February 8th, 2019 at and is filed under Asia Pacific, Auto Shows, Automakers, Business, Chicago, China, Europe, Executives, Ford, Markets, NAFTA, Personalities, Politicians, SUVs, Sales, South America, Technology, Trends, U.S./North America, UAW, Union. You can follow any responses to this entry through the RSS 2.0 feed. Both comments and pings are currently closed.